Natural Import Company - Traditional Japanese foods - Mitoku Black Sesame Seeds - 12 oz. Mitoku Black Sesame Seeds - 12 oz. Ingredients: Japanese natural black sesame seeds (non-dyed). Whole black sesame seeds, known as kuro goma in Japanese are indispensable for authentic Japanese cuisine. 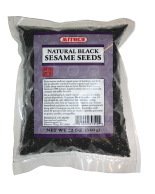 These black sesame seeds are 100% pure and are not coated with any artificial dyes. They may be toasted to bring out their full flavor and aroma and goodness or crushed to make fresh homemade gomashio (sesame-salt sprinkle).